Presenting itself in 2014 with the Explorer Yacht 550 model, Sundeck yachts shows the project for a new 430 Open model. 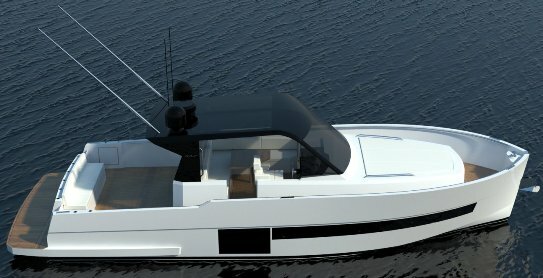 A new course for the young builder with a lot of experienced staff behind it, the new Sundeck 430 Open is like the explorer yachts of the Italian builder a design of Zuccheri. Sundeck says the new 430 Open is a mix of sport-fishing design solutions mixed into a cruiser. So far I am not sure about this claim since the bench settee at transom and integrated bathing platform are considered as nonsense to the sport-fisherman. Non the less the Sundeck 430 Open seems to make an interesting offer for those who want a large practical open sport yacht with a lot of safety features put into the design. See the deep walk around side deck, and T-top style hardtop covered central helm station. But the interesting solutions do not stop outside, and the Sundeck 430 Open also offers a three double cabin interior, and an important range thanks to the 2000 liters fuel capacity.